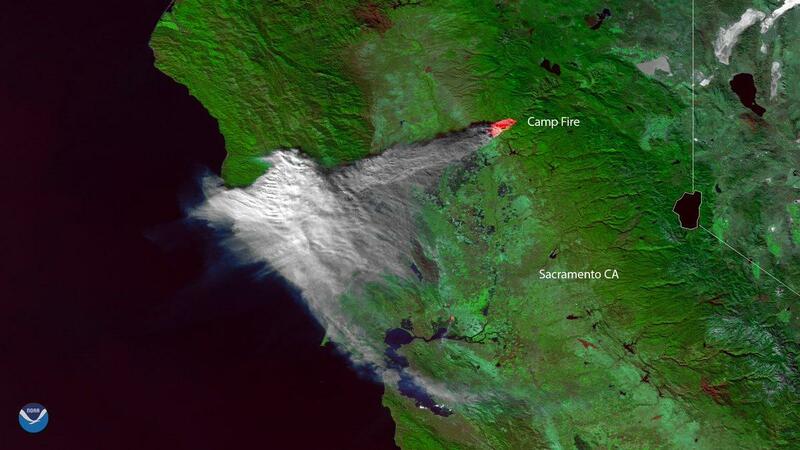 The Camp Fire, seen here by NOAA satellites on Nov. 8. Smoke from the devastating California wildfires has reached Michigan, but it won’t be around for long. Authorities have more than doubled their estimates of buildings destroyed in Southern California's huge wildfire. Officials said Monday that an estimated 370 structures burned and that only 15% of their damage estimate has been completed. The size of the fire has also increased to more than 143 square miles (370 square kilometers) and was 20% contained Monday morning. The fire erupted last Thursday as gusty, dry Santa Ana winds picked up, and spread rapidly through communities stretching from northwest of Los Angeles to the Malibu coast. Sara Pampreen is a meteorologist with the National Weather Service in Detroit. She says the jet stream is carrying the smoke from the wildfires our way. “Smoke gets so high up in the air and the jet stream takes it up and it’s actually positioned right over us,” says Pampreen. Pampreen says it’s not unusual for smoke from major western wildfires to reach the Great Lakes region. But she says changing weather fronts will move the smoke out of our region this evening. The Michigan Department of Environmental Quality is reporting increased levels of fine particulate air pollution caused by smoke from the California wildfires. Stephanie Hengesbach is a meteorologist with the Air Quality Division within the MDEQ. She says the levels of fine particles found in the air are higher than expected, given the time of year, regional weather conditions, and direction of the wind.